[By Nick, Discontinued] Awhile back, one of our readers mentioned that in their opinion, Stonyfield made the greatest coffee frozen yogurt. Well to be honest, I had tried their Gotta Have Java flavor a long time ago but couldn’t remember being as blown away as they were. So with that comment, I thought it was about time I revisited that flavor and gave it a proper review. Hopefully my memory is fuzzy and it truly is as good as they say it is. The description is pretty straightforward and it looks like we’re going back into their non-fat line. Gary once again chimes in saying “If you crave a real coffee indulgence, this is nirvana. My wife Meg grew up drinking robust coffee in a second-generation French household, and this stuff aces even her test. 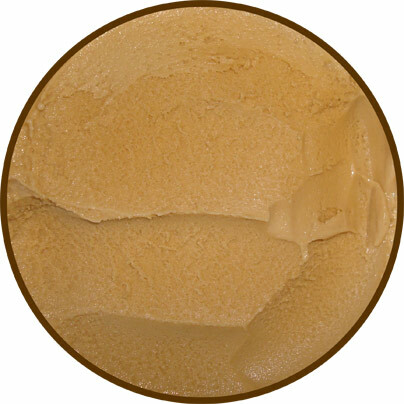 We've combined superb organic coffee flavor with creamy organic nonfat frozen yogurt. I give you divine bliss, java lover. –Gary” Well I guess if his wife approves it must be good right? I don’t really think of the French when I think of coffee appreciation but I’ll take Gary’s word on this one. One thing to note, the cow is now wearing something that resembles an ascot. Yeah, I just went all Scooby-Doo on you guys. As you can see, it looks just how you’d imagine it to. It kind of reminds me of the color of a Dunkin Donuts Coffee Coolatta. I was expecting some sort of scent to come off this one but it’s pretty neutral. That neutral quality dissipates once you take a bite though. This is some potent stuff. I do like my coffee more on the black side so this was a nice surprise compared to the usual sugar-laden coffee frozen desserts. You’re immediately hit with a strong robust coffee flavor which quickly mellows out into a southing milky finish. I will say that it is slightly bitter off the bat but it was something I enjoyed. This stuff is pretty addicting and that’s saying a lot for someone who is still iffy about coffee flavored things. I still can’t get over how creamy Stonyfield’s non-fat flavors are. It just defies logic with literally no iciness to it at all. Now is this the best frozen yogurt I’ve had? No because I do prefer my mix-ins but it is one of the best frozen yogurt bases I have ever had. My hat is off to you once again Gary. Verdict? Another remarkable base pint by Stonyfield. Buy Again? I’m not sure why I haven’t bought this one more often honestly. Thanks for doing this after my recommendation! I agree that this one starts off a bit bitter at first but the more you consume it the more it mellows out, and yes, it is very addicting. I think it tastes better than most coffee ice creams and so I rank it #2 as my all-time favorite coffee frozen dessert with Haagen-Dazs' Cappuccino being #1. 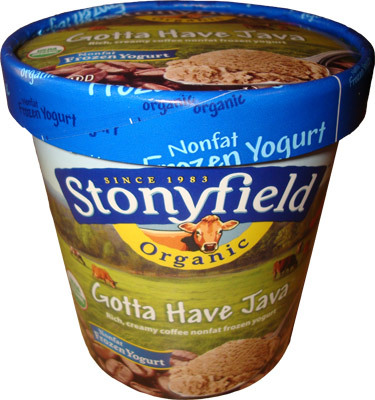 But in terms of health, I will pick Stonyfield's "Gotta Have Java" first any day because a whole pint is fat-free, yet very creamy and only 400 calories. No problem, Stride! This is definitely the base coffee flavor I would use in making sundaes and such for the health factors as well as flavor. Anon, you can try their flavor locator out: http://www.stonyfield.com/products/store-locator You can select individual flavors you'd like to find and search which stores around you carry them. Couldn't agree more! This is outstanding coffee frozen yogurt, and the best part is the whole thing is only 400 calories! I am appalled that Stonyfield Farms has discontinued this product. Whole Foods stopped stocking it after Amazon took them over. Soon after this product was discontinued. Keep searching! I'm sure there is another coffee flavor out there for you.